Our patio doors are designed for exceptional style with the utmost in comfort and security, along with vinyl extrusions being 25% thicker than most other patio doors. Our doors have been tested to withstand over 180 MPH winds as well as will not crack, rot, warp or split. Farley<sup></sup> patio doors are truly built to last. The Stanley Classic Commercial Brown 5' Garden Door is a traditional in-swing design. Sliding screen included to match door colour. Long term performance and elegance, this unit boasts ENERGY STAR certification, and energy efficiency features such as Low-e Argon tempered glass, door slabs are insulated with a polyurethane core and full perimeter double magnetic weather-stripping surround the unit for increased weather protection and air leakage prevention. Corrosion & rust resistant. A self-draining and adjustable sweep sill prevents water entry as well. The unit is double bored and ready to accept a lock set and deadbolt (not included). The unit is pre-hung and ready to install, including a factory prefinished white interior, Commercial Brown exterior Stancoat maintenance free finish. PLEASE ALLOW 2-3 WEEKS FOR DELIVERY AS THE DOOR IS CUSTOM MADE. The Stanley Classic Black 5' Garden Door is a traditional in-swing design. Sliding screen included to match door colour. These mini blinds are incorporated into our factory sealed units and are available in white only. Once sealed these units are totally dust and maintenance free, offering a high level of control, convenience, privacy and durability while preserving the charm and clean appearance of your home's interior. Long term performance and elegance, energy efficiency, tempered glass, door slabs are insulated with a polyurethane core and full perimeter double magnetic weather-stripping surround the unit for increased weather protection and air leakage prevention. Corrosion & rust resistant. A self-draining and adjustable sweep sill prevents water entry as well. The unit is double bored and ready to accept a lock set and deadbolt (not included). The unit is pre-hung and ready to install, including a factory prefinished White interior, Black exterior Stancoat maintenance free finish. PLEASE ALLOW 2-3 WEEKS FOR DELIVERY AS THE DOOR IS CUSTOM MADE. 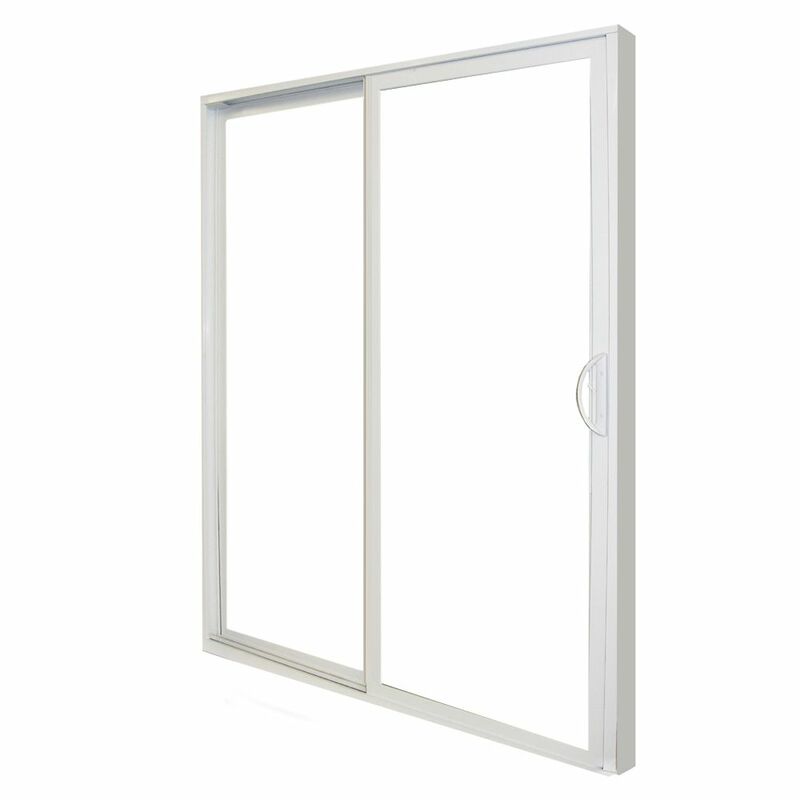 5 Feet Sliding Patio Door PVC RH Our patio doors are designed for exceptional style with the utmost in comfort and security, along with vinyl extrusions being 25% thicker than most other patio doors. Our doors have been tested to withstand over 180 MPH winds as well as will not crack, rot, warp or split. Farley<sup></sup> patio doors are truly built to last.